All the recent talk around Zinedine Zidane possibly becoming the next Manchester United manager took another twist yesterday as CaughtOffside were told he’s spoken to Antoine Griezmann about a transfer to Old Trafford if he does end up replacing Jose Mourinho. The France international could be a superb signing for United after his fine form for Atletico Madrid and his national team down the years, and he looks just what the Red Devils need to get back to the very top. It remains to be seen of course if Zidane will in fact get the chance to replace Mourinho at United, but as this speculation won’t die down, we thought we’d take a look at how the team could potentially line up under the Frenchman if he were to come in. 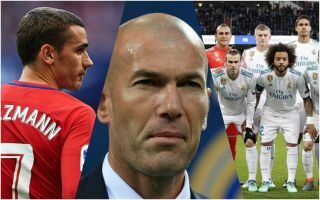 As well as Griezmann, the Premier League giants could also raid Zidane’s old club Real Madrid if he were to come in, with Don Balon recently stating he’d want them to sign Toni Kroos, Raphael Varane and Karim Benzema. All three could certainly do jobs for this side, though Benzema would most likely have to make do with a place on the bench unless Zidane were to get rid of some other attacking players already on the books in Manchester. Varane alongside Bailly in defence would be a big improvement on players like Chris Smalling, Phil Jones and Victor Lindelof back there, with Bailly in need of a more high calibre partner to help him fulfil his potential. In midfield, it seems likely Zidane could opt for a three like this as he often did during his time with Los Blancos, with Kroos slotting in alongside Paul Pogba nicely, and Nemanja Matic providing the more defensive option behind them. For Real, Zidane’s biggest successes tended to come with Casemiro playing that deeper role as Matic is above, with Kroos alongside Luka Modric in the middle. Toni Kroos to Manchester United under Zinedine Zidane? Up front, a trio of Alexis Sanchez, Antoine Griezmann and Romelu Lukaku looks as good as anything in Europe, and could give Zidane something close to the type of firing line he had with Cristiano Ronaldo, Gareth Bale and Benzema. Although Sanchez has been slow to get going in a United shirt since his January transfer from Arsenal, he could improve with this better calibre of player alongside him, with Kroos a fine option to provide creativity from midfield, and Griezmann another useful attacking outlet to help the team link up better in attack.